Comrades, we are planting far too many daylilies. Not just too many per garden, yard, and landscape, but too many tucked together side-by-side, in vast beds, swaths, and trails that are beginning to define the American gardening style in two words: Daylily Delirium. Here’s the problem with daylilies: Their foliage brings nothing to the party. Nothing. Daylily clumps quickly grow large, and what comprises each clump is great, flopping waves of long, plain leaves that the eye dismisses completely. Those leaves go everywhere, sabotaging the sight lines to plants nearby. There is one in the world with variegated foliage, a lovely English woman in St. Paul grows it, but she can’t remember its name, or where she got it. If any readers know of it, and where to get it, please e-mail me, and I’ll pass the news along. But I digress. In bloom, yes, a daylily is a delight, large, colorful blooms in as many colors (and color combinations) as there are dollar signs in the eyes of plant hybridizers. But when they are not in bloom, which is seventy-five percent of the growing season, they are nearly complete liabilities. A daylily takes up a lot of space, even the small varieties, and that space is wasted except for the three weeks the plant is in bloom. Some will respond, “That’s why you plant a bed with ten varieties, daylilies that bloom from mid-June to late August.” But I contend that you’re betting the whole boat on color, because there will be zero contrast in foliage, plant to plant. All the plants in that bed that are not in bloom at any given time, they grant nothing to look at. When a daylily is done blooming (and for the period before it blooms) it lies there like Jabba the Hut, leaves flopping about, finally turning yellow, then brown, from mid-season on. You can take this anyway you’d like, but as a garden scout for magazines, I get to tour a lot of really exceptional private gardens. At the Garden Writers Association convention each year (Chicago, this August) we all tour the best of a city’s private residential gardens. Been doing it for years now. What is one of the rarest plants to encounter during these tours of fine gardens? The daylily. You’ll see one, two. Tomorrow we’re shooting Marge Hols’s garden (the wonderful garden writer for the St. Paul Pioneer Press) in St. Paul, and she has exactly one daylily in her magnificent back yard. It’s a beauty, wine-colored, planted the way I like to see a daylily, as a single specimen, on a point near the house, where, in bloom, it looks terrific. After bloom, it’s hidden by taller, late-season blooming perennials of a higher order. Many great gardens have none. Yes, there’s a snoot thing going on, but snooty opinions from expert gardeners (gardeners who have created far more beautiful gardens than I) warrant contemplation. The orange daylily is perhaps the single most despised plant, among opinionated gardeners, in all of gardening. The variegated daylily I told you about in St. Paul? It blooms in orange, and the fastidious English woman who grows it snips off the stems before they can form buds. She grows it for the leaves. Plant one bed of nothing but daylilies, or line your driveway with them, or cluster them in a vast entrance “garden” down by the street, and you’re done for. The big question to ask: Are you after beauty? Elegance? Charm? Are those the goals here? There are ten million different ways to do that bed, to line that driveway, to herald the entrance to your house, that will be more beautiful, graceful, and charming. And of course, don’t make the mistake of thinking you are growing lilies. 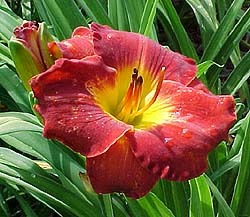 Daylilies are genus Hemerocallis, while lilies are Lilium. They are not remotely related. The nursery industry decided that they would make daylilies the next, indispensable perennial thirty years ago and doubted that dumb gardeners could remember (or pronounce) Hemerocallis, so they came up with the marketing name “daylily,” since each bloom lasts only one day. 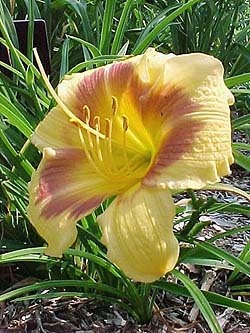 Forget about the “repeat bloomers.” I won’t repeat my rant, found elsewhere on this site, about the ridiculous reputation of the Stella de Oro daylily, except to say that it is one of the greatest examples of the Emperor’s New Clothes syndrome in all of nurserydom. No plant has put the development of fundamental American gardening style back further than Stella. Reedy, lousy little foliage and a small, bland, yellow bloom in late June, whoopee. Then, if you deadhead and fertilize, a thoroughly unconvincing second spray of meager little blooms takes place for about twenty minutes in August. Just leave the thing alone, and this second wave is even more underwhelming. Meanwhile, you’ve got this ugly plant for six months. The biggest curse is commercial landscapers. Landscapers plant Stella everywhere, mass entire beds of them. For many landscapers it is the only full variety name of a plant they know. Go to the bank, the gas station, the fast-food drive-through, all you see are Stella de Oro daylilies. It has become the Plant of America. It’s like a science fiction movie. There’s even a dwarf now, Mini-Stella, granted, less of a bad thing. 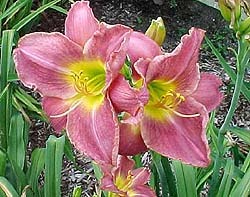 You love daylilies? I recommend you find three, four, five that you really love, a nice purple-grape, a good, big yellow, perhaps a red-and-gold, there are some wonderful peach-colored varieties, plant them in your lovely garden, as singles, spread way out from each other, middle to rear of the bed, and enjoy them. After that, enough with the damn daylilies.